A reproduction Nintendo Campus Challenge cartridge. Nintendo Campus Challenge is a special cartridge used in the events of the same name. There are two different cartridges produced for each event: a Nintendo Entertainment System version for the 1990 competition and a Super Nintendo Entertainment System cartridge for the 1992 competition. The cartridge is considered to be even rarer than the Nintendo World Championships cartridge with only one known to exist. It is currently owned by a private collector. The NES game was used in the 1991 Nintendo Campus Challenge that toured fifty cities. The top prize was an all-expense trip to Florida for the next tournament, which took place in 1992. The NES game is a combination of Super Mario Bros. 3, Dr. Mario, and Pinbot. In Super Mario Bros. 3, the player must collect 25 coins. In Pinbot, the player must reach 100,000 points. Finally, in Dr. Mario, the player must score as high as possible. It is unknown whether Pinbot or Dr. Mario were modified, but it is known that Super Mario Bros. 3 was. After the allotted time ends, the player's scores are totaled; their score from Super Mario Bros. 3 is multiplied by ten and the score from Dr. Mario is multiplied by 100. 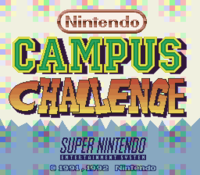 In 1992, the Nintendo Campus Challenge visited thirty-five different campuses including Central Michigan University, Arizona State University, and Texas A & M University. This version of the game game was a combination of Super Mario World, F-Zero, and Pilotwings. Like the NES game, it too was modified. In Super Mario World, players are required to get fifty coins. In F-Zero, players are required to complete two laps. In Pilotwings, players are required to parachute from two planes and land on a certain target. While the Super Mario World score was unadjusted, simply being the player's overall score at the time of completing the challenge, the F-Zero score was multiplied by 100 and the Pilotwings score was multiplied by 10,000. 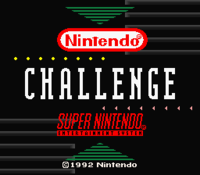 The first place winner at each university received a Super Nintendo Entertainment System and full retail copies of the three games included in the challenge, while Second, third, and fourth place winners got $100, $75, and $50, respectively. The grand prize winner received $10,000. This page was last edited on September 26, 2017, at 19:14.